A couple of weeks ago someone mentioned that there were some FPGA related articles in the December issue of Circuit Cellar. So I checked it, and one of the articles pointed me to the built-in logic analyzers that the leading tool chains now all seem to have. At least, the Circuit Cellar article is about Chipscope, which is the Xilinx variant, and Altera has something similar called SignalTap. Since most of my Xilinx stuff has been stored away since last years spring cleaning, I decided to go and play with SignalTap. And as usual with the FPGA tooling, the first impression was not that favourable. But a couple of days later I thought to try again, and this time around I started to appreciate some of the things that the software can do. For instance, tap into an enormous lot of signals at a time – at least certainly compared to my old ‘real’ analyzer, which can do only 32 signals. And the amount of capture memory is also decent, provided you’ve some room in your FPGA memories. But more interesting is the trick where you can let the analyzer capture when some subset of the signals change state. And you can assign names to bit pattern values in a capture. Those two tricks I used to finally find the problem that prevented RSX-11M-Plus from booting – first, I used the address match signal within the RH11 controller logic as a trigger for the analyzer to capture state, and second, I assigned the register names of the control registers within the RH11 to the address signal. So, I thought that would give me a nice and easy overview of exactly what RSX-11M-Plus was doing to the RH, and what would cause it to get wrong results. And that is exactly what it did – only, not in the way I expected. Took me some time to see something that in retrospect is very obvious; there is a write to a register in the RH11 space, but it isn’t decoded into a register name – even though I added register names for all registers that I knew about. Aha. So, something going on here… The first thing I checked was whether it could be a controller register or a disk register – in a real setup with RH and RP, some of the registers reside in the disk, others in the controller. I decided to verify all the controller side registers first – and the one that I was consistently missing was BAE, the register that holds the bits 21-16 of the address for the controller. A quick change to the controller source proved that to be correct; if I assigned BAE to this register address, suddenly RSX-11M-Plus would boot happily… And it seems to run quite happily as well, including running complete sysgens, and also running Decnet and other software. A couple of things still need some clarification; mostly, do other registers also live at other addresses than I would expect them. 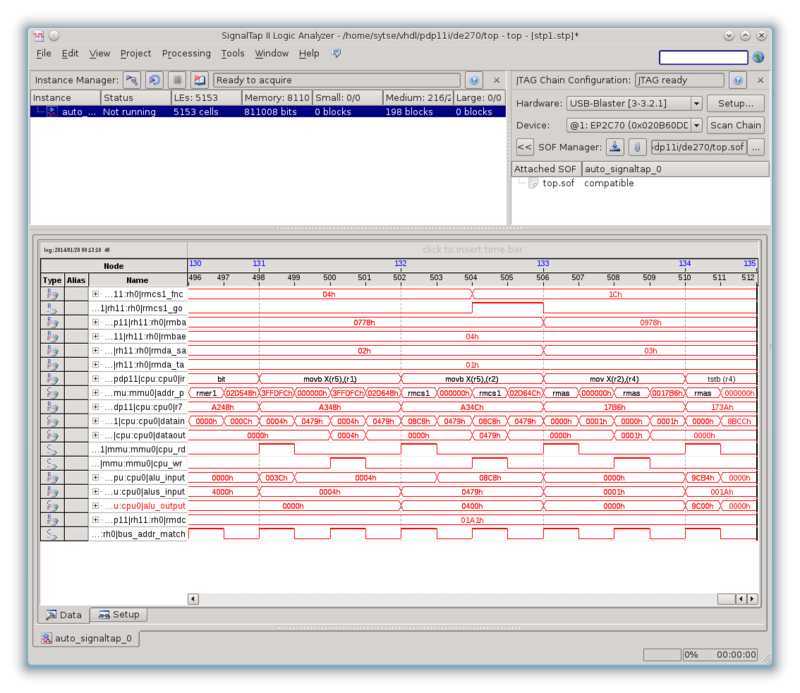 Once that is done, and I’ve completed my usual regression tests, I’ll be posting the new vhdl to the download page. 1 comment to RSX11M-Plus. Finally. Great news! I currently run RT-11 on my FPGA. It’s up almost 100% of time and it’s a lot of fun. Can’t wait to see RSX11M+ running as well.